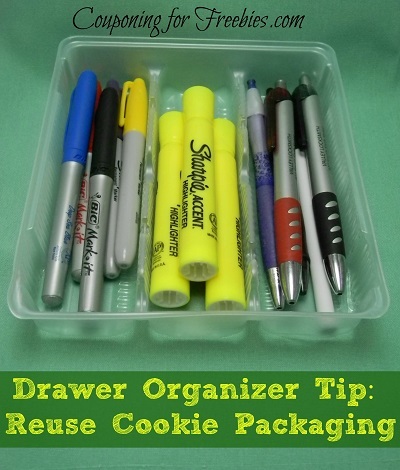 Drawer Organizer Tip: Reuse The Cookie Packaging For Drawer Organizer! Is your drawers a mess? Do you have a hard time finding something when you are looking for it? There is nothing worse than trying to find a pen to make a note and having to dig through all the other markers and highlighters. Well if you are looking for an idea for a drawer organizer, then you have come to the right place. I know you can pickup a drawer organizer in the store for about $10 or more, but I am always looking for ways to reuse/recycle items I already have. Not only does this cut down on waste to help the earth, it also helps cut down on spending. It may only be $10 or so to buy, but when you add that up for the little items that you pickup over a years time, it really adds up. So I set down with a snack of Oreos to think of what I could use to get my drawers a little better organized. Then it hit me! The answer was right in front of me. Why not use the dividers that come in cookie packaging?? I know the one that comes in a pack of Oreos is not made from thin flimsy plastic, but yet is made a little more heavy-duty. It would work perfect for a drawer organizer! It would work great as a drawer organizer in a desk. You can keep all your pens, markers & pencils all separate. Make them easy to find when you need them. So the next time you treat yourself to some cookies, remember to save the divider that they come in to use as a drawer organizer. If you are looking for other ideas for reusing items or storing things be sure to check out my post on reuse coffee creamer containers. I love this idea.I have used small cardboard boxes for this purpose but this looks to be a better idea. Thanks for sharing it.